Community Initiatives is the fiscal sponsor for Educators for Fair Consideration. 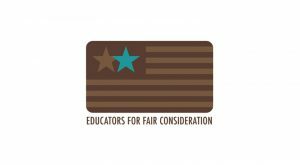 Educators for Fair Consideration (E4FC) empowers undocumented young people to achieve their academic and career goals and actively contribute to society. It provides scholarships, legal services, and professional and personal development for undocumented youth in the San Francisco Bay Area. This grant extends support for E4FC’s Invest in the Dream initiative, providing matching grants to nonprofit scholarship providers nationwide, thus increasing financial support for undocumented students pursuing higher education. Despite an opening for more scholarship providers to support students aspiring to access higher education, undocumented youth who have been granted deferment of deportation under the federal Deferred Action for Childhood Arrivals (DACA) program are still excluded from all federal financial aid, most state-based financial aid, and even most in-state tuition discounts. Without adequate financial support, few undocumented students pursue or complete higher education degrees. In 2013, with Foundation support, E4FC initiated the Invest in the Dream initiative. In addition to providing matching funds, E4FC also provides nonprofit awardees with access to information and resources to better serve undocumented students.